Take I-77 to SR-82 east. Proceed approximately 6 miles to Brandywine Rd., then turn right. Proceed on Brandywine Rd. Parking will be on the left; the Inn parking appears shortly after that. Entrance to the park locations is free; fees for special programs, rentals and additional accesses may be required. Reservations ARE required for lodging at nearby Stanford House (via Stanford Trail) and the Inn at Brandywine Falls. 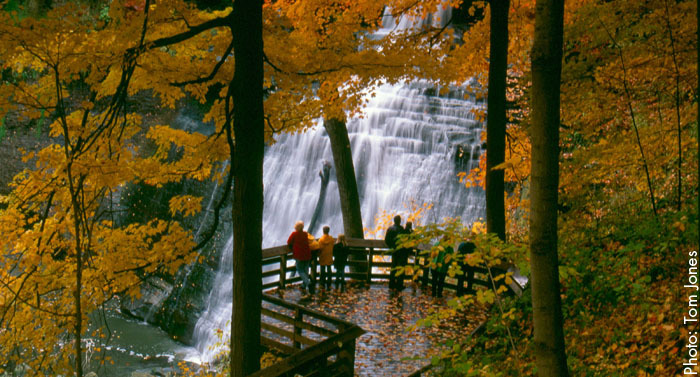 Chock full of sandstone and shale, peppered with hemlock, white oak, black locust, maple trees, and bearing a color palette that is ever-changing, these Falls make a great starting point or finish line to any major trek through the surrounding CVNP trails. Whether you choose the Brandywine Gorge Trail, or the Stanford Trail (or both), or simply chose a more in-and-out sightseeing stop, there is plenty to take in here. Between the beautiful vistas and dramatic views at nearly every point in the hike, and its moderate skill level, hikers are sure to get a thrill of the Gorge Trail. So much of the CVNP is a beautiful geological marvel, but the Brandywine Falls site itself is pretty remarkable. Hikers and sightseers who are up for a challenge that bumps up their heart rate. Oh, and kids. Most definitely children, from kindergarten to the inner child you might be toting around within you. In all seriousness, if you’re an active parent with kids who soak up ecological adventure and science, the bonus here to tiring the kids out comes with exploring the complex biome that this area is. It’s a fully-functional history, biology, chemistry, and geoscience site all in one—replete with frogs, salamanders, and a who’s who of birdlife if your visit is timed right.